(VIP Wings A.S.) (V5/VPA) (Bratislava, Slovakia) 2008 - 2013. Photos. Framable Color Prints and Posters. Digital Sharp Images. Aviation Gifts. Slide Shows. Danube Wings (DanubeWings.eu) ATR 72-202 OM-VRC (msn 307) BLQ (Marco Finelli). Image: 905194. DanubeWings (DanubeWings.com) (Bratislava) is the brand name of a regional scheduled and charter airline in Slovakia. The brand is owned by VIP Wings which also owns the AOC. VIP Wings was created from VIP Air, the first private aviation company in Slovakia. 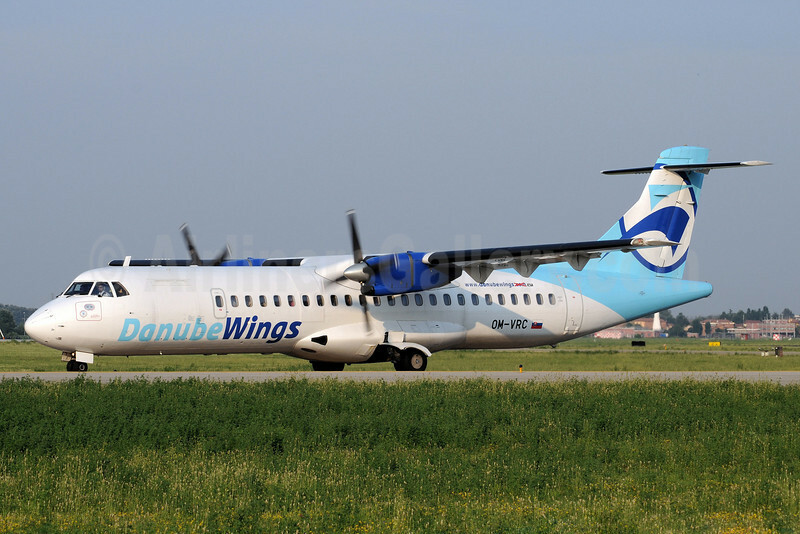 DanubeWings commenced operations in 2008 with ATR 72-200 turboprops. Czech Airlines-CSA started operating a wet leased Boeing 737-400 (OK-WGY) on December 1, 2009 between Poprad-Tatry and London (Stansted), Manchester and Dublin. In July 2010 DanubeWings (www.danubewings.eu) (Bratislava) changed its web address. The airline is striking out the ”.com” on the aircraft and adding a new “.eu” in its place. ATR 72-202 OM-VRC (msn 307) taxies past the camera at Bologna showing the subtle change.